Winter is coming and so too the night of horror, fright and undeath - what the mortals and living know as Halloween. 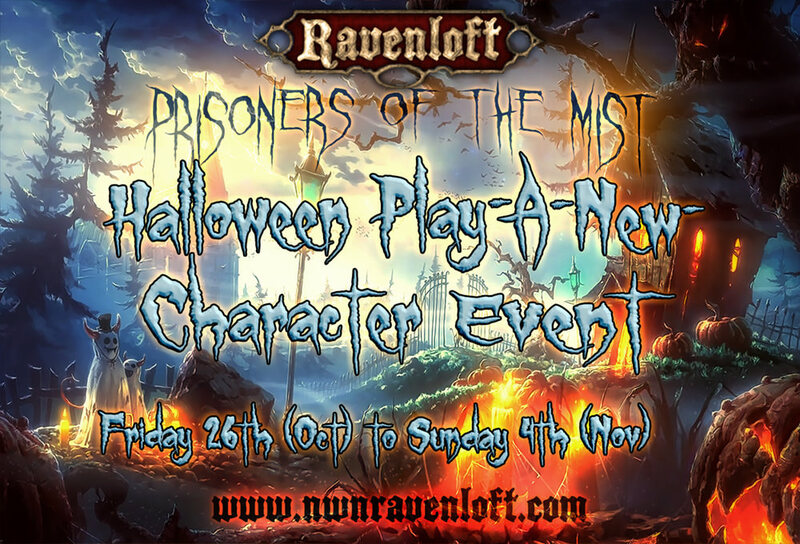 Naturally, we at Ravenloft - Prisoners of the Mist want to mark this occasion to summon the darkness, and therefore we will run yet another of our "Play-A-New-Character" events. For those unfamiliar with the concept, this is an event where all participants roll up entirely new characters*, providing an equal start for all in an exclusively low level environment. This isn't just an excellent opportunity for new players to join in and quickly get involved in the shared narratives, but it is also a simply but effective way of naturally generating an abundance of both exhilarating, frightening and immersive gothic horror roleplay. So come join us for a treat of some of the best online roleplay there is, while meeting with new and old friends alike! Hardly any tricks involved! The event will be running from October 26th (Friday) to November 4th (Sunday) (2018). Expect a number of DM events and special occurrences to appear in game during the period, but we also invite you to use our forums for pre-planning things with other players. There's a general topic for this purpose here. And keep an eye on this topic as we will keep updating it with more info in the coming days. with all relevant info. If you have any questions, please use this topic to post them: link. - You can create your character pre-event and still use it for the event, as long as the character hasn't passed through the intro-cutscene. - If you've created a character before the event and have passed through the intro-cutscene with it, there will be ordinances available that allows converting pre-played characters to be eligible for taking part in the event. This however entails loosing all acquired items and XP. - Remember that while finding people to revive a friend or the sufficient gold to have an NPC do it will be hard during the event, the XP loss of using the shaft of light in the Near Ethereal to restore you to life is very small at lower levels. - All pre-existing characters have their starting points relocated to points outside the zone of the event if logging in while it's running. If you would like to avoid this, simply refrain from logging on to that character during the event. - Players that prior to the event own characters that are members of a faction is allowed to make a new character for the event that starts out as a member of this faction. The exception to this rule is characters of the Ba'al Verzi, the Dawnslayers, the Van Ritchen Society and the Fraternity of Shadows factions. - Players that prior to the event own a AMPC or MPC character can make new characters for the event that start out as AMPC. They will have a maximum lifespan of the event. - Players that do not prior to the event own an AMPC or MPC character but wish to make one for the event can apply for that on the usual AMPC terms. We will however be more lenient toward accepting such AMPCs compared to usual. - Players who do not want to take part in the event but rather roleplay their existing characters outside the zone of the event is allowed to, but have to make up their own IC reasoning as to why they ended up outside the zone. The Play-A-New-Character event has now begun! We encourage you all to not just see this as an opportunity to experience some excellent gothic horror roleplay, but also as an occasion to form new alliances and friendships, both IC and OOC - in part for the sake of your characters' own survival, but also to strengthen our community as whole. Additionally, we hope to welcome many new players for this event as well as many returning old. Please do your part to make sure these people feel welcome and allow them to easily become a part of things. And as always, strive to hone the fact that this server is about gothic horror roleplay. We expect that the circumstances of the event will quite naturally lead to it in abundance, but please help us preserving and furthering that atmosphere in your roleplay, and take your part in building and enhancing it too. Looking forward to meeting you there. Now let the roleplay begin!